A wayfinding program that gets you seen! 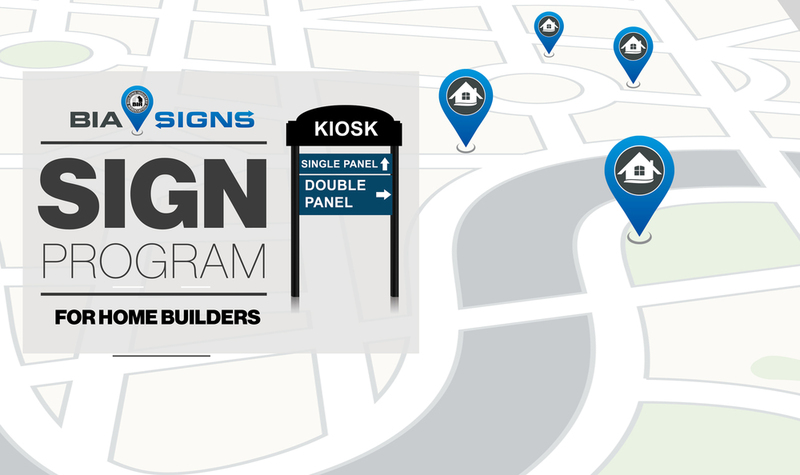 What is the Kiosk Directional Sign Program? It is a directional signage program for our home builders, apartment communities and retailers throughout Southern California to assist the homebuyer, renters and consumers to locating new subdivisions and homes. With the limitations on signage in Southern California the BIA with our local municipalities developed the sign program. The kiosks are temporary signs with arrow directions that are installed along our roadways with the approval of our local municipalities. The sign program is a good balance for our municipalities to manage the increasing need on signage in a uniform way. The BIA operates and manages the sign program from installation to maintenance. What are the benefits to participate? The kiosks are up 24 hours a day, 7 days a week. It is a traffic generator for you communities. Upgrades the appearance of the area surrounding you communities. Offers your customers a consistent look on the roadway. Maximizes the effectiveness of your print and online advertising to increase customer traffic. It is the only permitted directional sign program in the county and city jurisdictions. Your marketing dollars go back to the support the BIA’s effort to keep homebuilding strong.